As the summer temperatures soar and the demand for cool, quenching water increases, the City of Prineville is trying to conserve as much H2O as possible. "The City of Prineville has been diligent about protecting the water it produces," said city spokesperson ShanRae Hawkins. "The city has ramped up its water conservation efforts to be good stewards of the resource." The effort includes a two-pronged approach. City staff has already been completing projects to more efficiently produce and account for water, with the intent of ensuring water is not wasted within the public water system. "Through maintenance and system upgrades, the city reduced unaccounted water loss from 27.9 percent in Fiscal Year 2009 to 4.7 percent in Fiscal Year 2018," Hawkins said. "The State of Oregon targets municipal water loss to be less than 10 percent, making the city's performance well ahead of expectations." Unaccounted water is the water produced by the city's well but is not sold to customers. Losses can be attributed to unmetered customers, leaking lines or inaccurate meters. The city's savings equals 150 million gallons of water a year, an amount city leaders playfully point out equals more than 1 billion pints of beer, or would fill a football field-sized tank more than 350 feet tall. The city is employing multiple tactics to conserve water on a continual basis. For example, the public works department is striving to update all of its approximately 3,800 water meters with new, more efficient remote read meters. Last year, the water department replaced and/or upgraded approximately 200 of them. Additional efforts include a Meadow Lakes Golf Course Water Conservation Project that removed the irrigation of 7.5 acres of land from the domestic water system, resulting in saving approximately 51,000 gallons of water per day. The savings is enough water to provide for 63 homes. Prineville Police Department upgraded its heating ventilating and air conditioning (HVAC) system, removing it from the domestic water system. The project saved approximately 36,000 gallons of water per day or enough water to provide for 45 new homes. 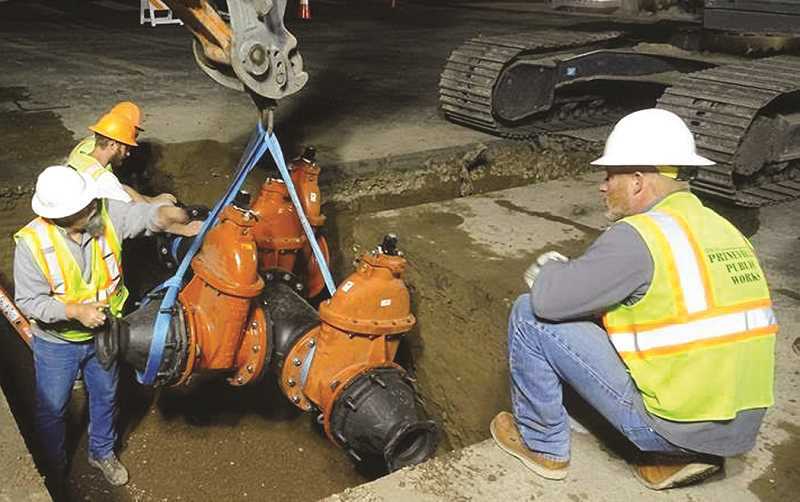 City staff also implemented an aggressive leak detection program, strategically replaced water mains and installed 2,458 feet of new water line. "The city has made a concerted effort to lower unaccounted water over the last several years," Hawkins said. "The efforts have resulted in a 23.2 percent reduction in unaccounted water loss." In addition to the public works projects, the city has reached out to its local water customers, emphasizing education as an important tool in promoting water conservation. Outreach has included water conservation tips in bill messages, social media posts related to conservation, issuing postcards with conservation messages, and conservation and stewardship education through partnerships with the schools. The city has also offered customers high-efficiency shower heads, low-flow faucet aerators, leak detector tablets to place in water closets to detect continuous leaks, and landscape water gauges to more accurately set sprinkler systems. "An adequate and reliable water supply is vital for the future of Prineville," said City Engineer Eric Klann. "The city is committed to implementing conservation strategies focused on preserving our water supply for future generations. We all must be mindful of our water usage and do our part to be water-smart."